Each year, the Department of Mechanical and Aerospace Engineering produces a newsletter highlighting some of the recent news and accomplishments of the department. We make all our newsletters available online in PDF format for our readers’ convenience. This year we give the MAE Newsletter a new look and name. 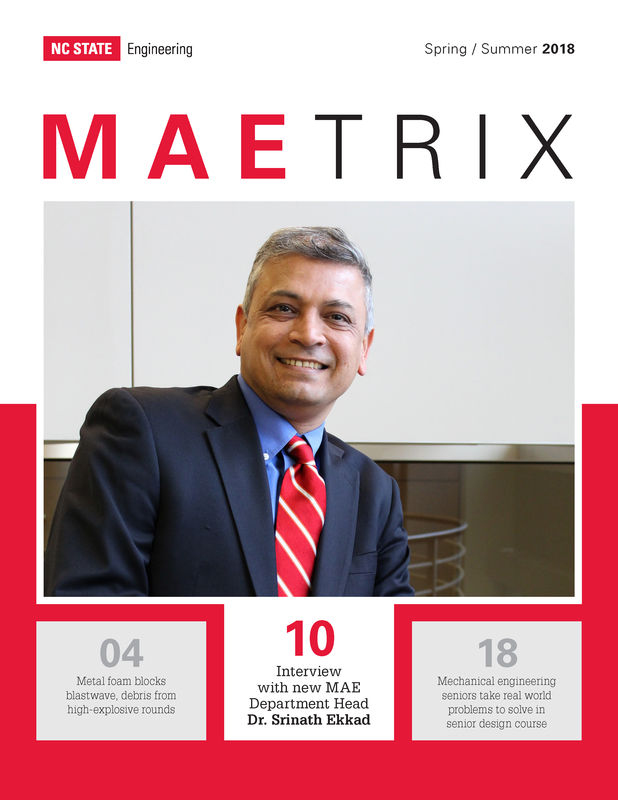 Included in this year’s MAETRIX is a recap of new department head, Dr. Srinath Ekkad’s, first year in MAE. You will also learn about many exciting things happening in the department including stories on groundbreaking research; and honors received by our students and staff. MAE in the World: MAE researchers are driving improvements in a wide-range of diverse areas. Program Updates: The latest news from the Undergraduate and Graduate programs. Awards and Honors: Faculty members and students are recognized for their outstanding accomplishments. Alumni Corner: Brandi Smith (’02 BSME), Director of Quality Control at Newport News Shipbuilding, shares advice and the department recognizes 20 outstanding graduates as part of the 2018 Hall of Fame class.